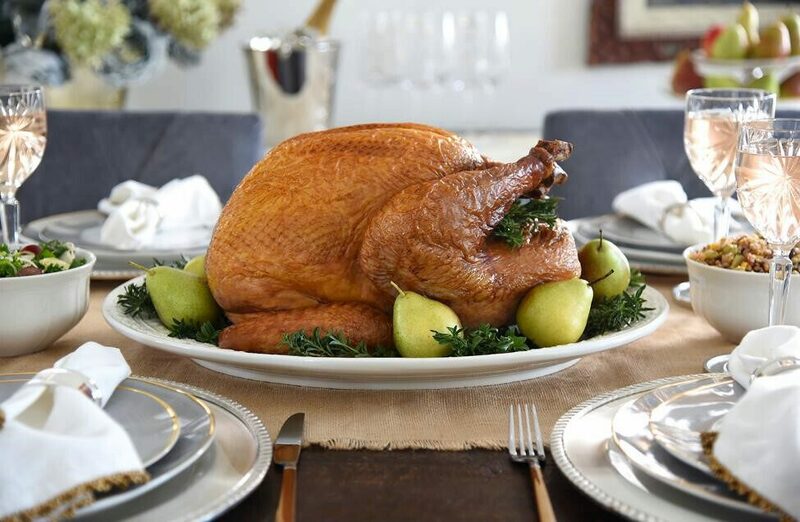 TIP: For extra crispy skin, prep your turkey at least a day before and dry out the skin by refrigerating t on a baking tray overnight prior to cooking. Combine the spices to make a rub. Rub both the inside and the outside of the turkey with olive oil and the spice rub. Roughly chop the onions, carrots and celery. Place half in the roasting pan and the other half, plus the lemon, into the cavity. Add the turkey to the roasting pan and set over the vegetables. Add the broth and the wine. Roast the turkey for 3 1/4–4 hours, until the juices run clear and an instant thermometer reads 180°F (82°C) in the thickest part of the thigh. Once cooked, remove the turkey from the oven and let it rest for at least 30 minutes before carving. Heat olive oil in a non-stick pan over high heat. Sear pear slices on both sides until lightly browned, 3-4 minutes. In the last minute, add cranberries and heat until they split, 1 minute. Combine pears, lemon juice, red onion, apple cider, maple syrup, salt, pepper, nutmeg and thyme in a sauce pan over medium heat. Lightly simmer until flavours combine and pears and fork tender and just begin to break down. Remove from heat, add cranberries and allow to cool.